LISA Pathfinder is testing the key elements that could be used for a future mission to detect gravitational waves – ripples in spacetime predicted by Albert Einstein in his General Theory of Relativity. To this end, it will release two test masses into near-perfect free fall and measure their motion with unprecedented accuracy. LISA Pathfinder was launched on 3 December 2015 and arrived today in its orbit around 'L1', a virtual point in space some 1.5 million km from Earth towards the Sun. LISA Pathfinder's arrival came after a final thruster burn using the spacecraft's hard-working propulsion module on 20 January. The small, 64-second firing was designed to slightly change its speed and just barely tip the craft onto its new orbit about L1. Since launch, the propulsion module raised the orbit around Earth six times, the last of which kicked it towards L1. "We had planned two burns to get us into final orbit at L1, but only one was needed," says Ian Harrison, Spacecraft Operations Manager at ESA's ESOC operations centre in Darmstadt, Germany. The propulsion module separated from the science section at 11:30 GMT (12:30 CET) today after the combination was set spinning for stability. "Heat and vibration from the regular, hot thrusters on the propulsion module would cause too much disturbance during the spacecraft's delicate technology demonstration mission," notes Ian. "Primary propulsion during the rest of the mission will be provided by cold-gas microthrusters to keep us at L1." These small thrusters were used in the hours after separation to kill the spin and stabilise the spacecraft. Today's operations were monitored by the mission control and science teams at ESOC in real time via the Agency's deep-space station at Malargüe, Argentina. During this evening, the craft will be slowly turned to point towards Earth and, around midnight, establish a full communications link via ESA's New Norcia ground station, Australia. 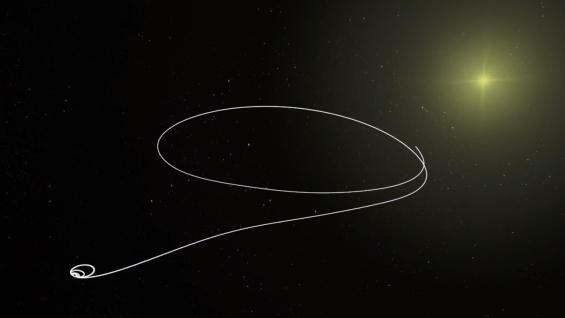 Next week, LISA Pathfinder's trajectory will be fine-tuned with a series of three thruster bursts, taking it onto its final orbit, a 500 000 × 800 000 km orbit around L1. L1 was chosen because it is a quiet place in space, far away from large bodies such as Earth and is ideal for communications. Preparing the spacecraft's systems and payload for work has already begun, with the full platform, the thrusters and the Disturbance Reduction System having already been checked. Last week, the laser that will measure the most precise free-fall ever obtained in space was switched on and tested. Next month, the two identical test cubes will be released in two steps. First, the launch lock fingers on the eight corners of each cube will be retracted on 3 February. Then, other mechanisms that secure the cubes will be released on 15 and 16 February. This will enable the craft to begin, on 1 March, demonstrating that we can measure the separation of target masses with the extremely high accuracy required to measure gravitational waves from space in the future. The relative motion of the two cubes will be measured by laser to within a staggering a billionth of a millimetre.